I hate lip gloss. Sorry, I know I’m a girl and I should like that gooey stuff that makes your lips look all sexual and gorgeous but personally I think it somehow highlights flaws and looks ridiculous. I don’t have a trout pout and I don’t want to try and make one using sticky icky stuff that my hair sticks to as soon as I go outside. But, I do like lip balm. I’ve tried most of them. Blistex Spa Effects was my favourite until recently when I realised it hasn’t helped one little bit with winter chapping, but does taste and feel nice when it’s on. Carmex is also great but would be better if it weren’t in an annoying pot. I have now, quite by accident, found a new and permanent favourite. Burt’s Bees. I was given the ‘Lip Shimmer’ stick in the Caramel shade by a friend earlier this year and I love it. It has a gentle sheen to it and is so moisturising; it has a minty, almost menthol smell and it instantly cools lips when you put it on so is very soothing. It lasts much longer than other balms I’ve tried and is the perfect colour. There, now who sounds girly? I’ve also recently been sent their Super Shiny Natural Lip Gloss in the Pucker Berry shade – yes, a lip gloss. 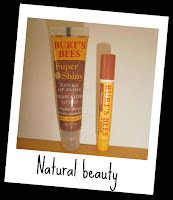 But Burt’s Bees’ natural ingredients make it far more moisturising and balm-like. It’s still something I wouldn’t put on before stepping out into windy London (hair stuck to lips = no thank you) but for night time in a bar, it’s just right. 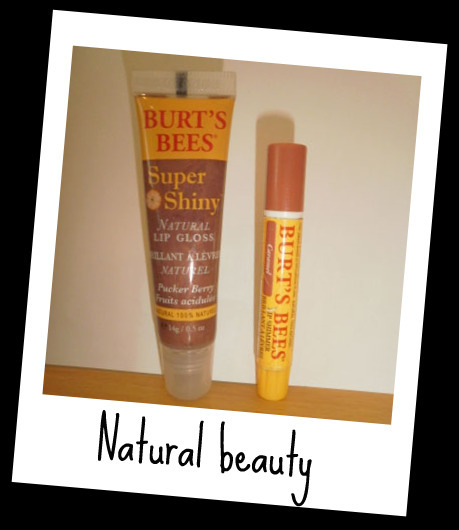 This entry was posted in beauty, burt's bees, lifestyle, lip balm, lip gloss. Bookmark the permalink.